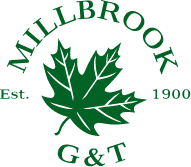 The Millbrook Golf & Tennis Club was founded in 1900 by six local residents who leased 60 acres of land. Two years later, that land plus another 8.5 acres, was purchased for $20,000 and the next year the Golf Club House was erected. In 1912 the first directory was published with about 24 regular members. © 2019 Millbrook Golf and Tennis. All Rights Reserved.